Those who had witnessed Jesus’ final sign continue to affect the story. They have believed in him and they become the fuel to the glory that he receives from the adoring crowd. In the other gospels it is not clear why such a loud crowd gathers to welcome the celebrity from Galilee. Now we see that Jesus is riding like a king into the city. Yet he is not in a Roman triumph or a war-like assault. Jesus’ entry into his glory is humble and contrary to what a king will usually perform. His throne will be contrary to the norm, too. When he is enthroned on the cross and raised to full glory, he will be in excruciating pain, asphyxiated and bleeding to death. The signs of Jesus point to the deeper purposes behind his humble actions. As he empties himself for the people and opens the door to new life, the signs point to his purposes. Now that we have transitioned in John from the Book of Signs to the Book of Glory, we see how the two fit together as a whole. The signs of Jesus give us understanding as to the true nature of his kingship. Are we willing to welcome him and follow him in his glory. His path of glory is one of humility, torture and death. Are we willing to accept the death that he brings so that we may ironically experience the new life Jesus offers? May we honour you because of the testimony of scripture that tells us who you are. May we sing with rejoicing that our king has come. May we worship you as you are glorified through the cross. May we walk with gratitude the new life that you have purchased. How is Jesus received in Jerusalem? How does Lazarus’ story play into the triumphal entry? Why is a prophecy inserted into the text? Who do the seven signs of Jesus (John 2-11) tell you Jesus is? How do you respond to Jesus approaching you with humility and setting himself up as king? 1. Jesus is receives with the praise of an adoring crowd who has heard of the miracle of Lazarus. 2. Lazarus’ story has spread throughout Jerusalem, making the population at large impressed by and curious about Jesus. This is why so many people gather to see him enter Jerusalem. 3. The prophecy, like many others throughout the gospels, prove that Jesus is the foretold Messiah. 4. The signs of Jesus are another witness that speak of his deity. 5. I’m often guilty of not receiving Jesus with the same praise and gratitude that the crowd did, but taking him too much for granted. 1. Jesus is received with praise from the adoring crowd who welcomed Him as a king. 2. The crowd heard about Jesus raising Lazarus from the dead so they wanted to see Jesus. 3. The prophecy is inserted to show that Jesus fulfilled it. 4. The seven signs of Jesus tell us that Jesus is the Son of God who has power over Creation, power to heal, and power to forgive sins. 5. I respond by worshiping Him as my saving King and asking Him to empty me of myself and fill me with Him. 1) He is welcomed and praised as He enters Jerusalem. 2) The people saw the miracle of Lazarus being raised from the dead, so they believed. When Jesus came to Jerusalem, they were overjoyed that He was again with them. 3) The prophecy is included to show that it was being fulfilled. 4) Jesus’ signs show His power and majesty! 5) Because of Jesus’ humility, it causes me to be thankful that I worship and serve a God who is not showy but who is humble and full of grace. 2. The crowd is greatly comprised of those who had heard of or seen Lazarus’ resurrection, and the people who had seen it would not stop talking about it! 3. 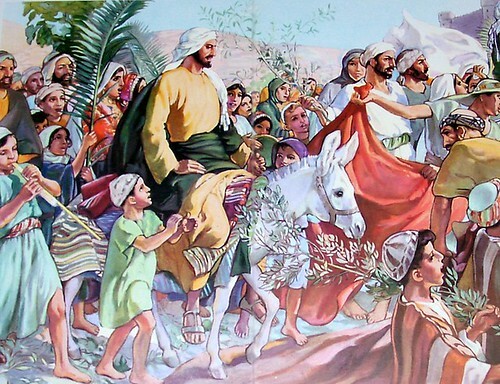 Jesus’ Triumphal Entry was predicted long ago as a sign of the Messiah. 4. Jesus has power over all of natural creation, demons, sickness, and even death! He is the Messiah! 5. I am awed at a God who comes to rescue me; who deserves worship and to be enthroned as creation’s King, but who comes to earth to serve and save me! Based on John’s account, Jesus is the Son of God. He is the Creator and Sustainer, and the Savior. He fulfills all our needs and is worthy of our worship. How do you respond to Jesus approaching you with humility and setting himself up as king? To me, the response is just being humbled myself. It is so humbling to think that God would become man, humbling Himself so thoroughly. He has every right to be worshiped as king. The crowed loves Jesus and praise him as he enters into the city. News about Lazarus has spread making Jesus popular among the people. The prophecy is included to show that it was fulfilled. Seeing how Jesus humbled himself, I also want to strive to be humble. 2. It’s interesting that John shows the miracle of raising Lazarus from the dead as the last miracle Jesus does from He raises Himself from the grave. I wonder if this really was the last miracle? I think his own resurrection was quite a miracle, so it wasn’t the last miracle, only the last sign. 1. In Jerusalem, Jesus is received with praise and rejoicing. 2. Many of the people at Jerusalem were coming from the site of Lazarus’ resurrection. Like fans touring with a band, they are no longer just observers but have transitioned over to participating in the events of Jesus’ life. 3. The passage recounts events that actually took place then reminds us that it is a fulfillment of prophecy, otherwise we would likely not recognize this just as the disciples had not. 4. The seven signs of Jesus tell me that he is the great comforter and healer. He never did any miracles to harm anyone, even his critics. Jesus really does know what’s best for us. We can’t get shook up when he puts a little mud in our eyes! 5. I love the irony in the character of Jesus and I love him for his humility. Every time I look at the world and think to myself, “That’s not it, that’s not what life is all about” I know it is the Holy Spirit guiding me in truth. Truth is beautiful, Jesus is beautiful. 1. Jesus is received with joy. 2. The same crowd that had viewed Lazarus’ resurrection was there. 3. The prophesy is shown to show that Jesus is the Messiah. 5. I can only respond with worship! Jesus enters humbly and is received with joy. People who saw Jesus raise Lazarus were also in the crowd when Jesus entered Jerusalem. The prophesy confirms that Christ is the fulfillment of the expected Messiah. I usually fail to see Jesus approaching me with humility. I assume that he barges in and asserts his lordship instead of entering humbly. When I think about it now, I realize that he is gently leading me as king. 1. How is Jesus received in Jerusalem? 2. How does Lazarus’ story play into the triumphal entry? It is because of Lazarus’ raising from the dead that the crowds are gathered there. 3. Why is a prophecy inserted into the text? To show that Jesus is fulfilling prophecy in his coming into Jerusalem. 4. Who do the seven signs of Jesus (John 2-11) tell you Jesus is? He is the Messiah, the Son of God, come to save the world from its sins. 5. How do you respond to Jesus approaching you with humility and setting himself up as king? With obedience and awe. Thankfulness and joy. The people cry out “Hosanna!” which means “Save now!” They wave palm branches and lay down their cloaks. The people in the crowd had seen/heard what Jesus had done and how He had raised Lazarus from the dead. To show that Jesus was fulfilling that prophecy as the Messiah. I respond with gratefulness and joy. Jesus is received with much positive fanfare and celebration, which is mostly directed towards the role of king that they expect Him to fill. Those who had been present when Jesus raised Lazarus from the dead had been spreading that story, resulting in the increase of Jesus’ fame in the area. I believe that John includes prophecy here to indicate to his readers another way in which Jesus fulfills the role that was foretold by the prophets. Additionally, this specific citation helps contemporary readers understand the background of the people who are hailing Him as king; they had heard Scriptures such as these for centuries, and they thought they knew exactly what they were waiting for. Thinking back on the past chapters, some things that stand out about Jesus’ character and nature are His compassion and empathy in interacting with those who follow Him (ie Lazarus’ sisters) as well as His bold proclamation of truth throughout His ministry. I am having a hard time conceptualizing Jesus coming to me, and processing how I respond to that. Occasionally, I try to envision Jesus literally present with me in a room or place, but that prospect honestly scares me a bit, what with His immanence and greatness. But I know that the act of Jesus coming, regardless of whether I can personally conceptualize it or not, was done in incredible and deeply personal love, and that I find to be both indescribably wonderful and so far beyond what I deserve. Jesus is received with adoration and a very warm welcome from the people of Jerusalem. equipped with palm branches and praise. The people of Jerusalem had heard of Jesus raising Lazarus from the dead and were mystified and wanted to see him for themselves. It was inserted to acknowledge that Jesus was fulfilling the prophecy and he was the Messiah. The signs that he performed in the Gospel of John point to his deity and it shows his power as the Son of God. It really humbles me reading about Jesus emptying himself and becoming a human in order to deem us righteous through his sacrifice.